Apple has just seeded iOS 6.1.3 Beta 2 to developers. They renamed the beta track from iOS 6.1.1 beta to 6.1.3 beta since there have been official iOS releases pushed out so quick. 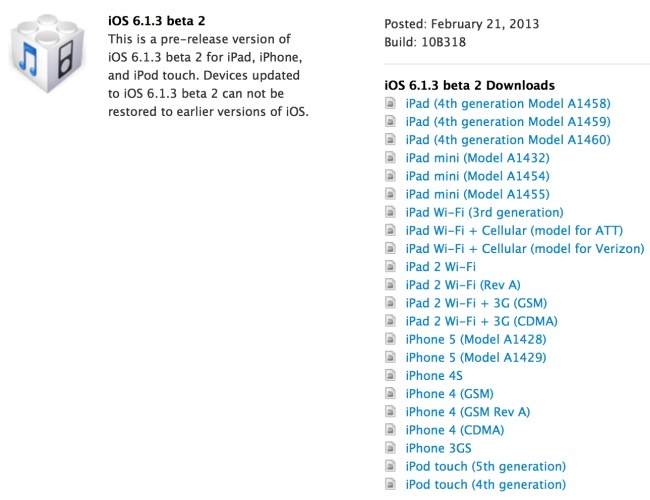 The build of iOS 6.1.3 is 10B318, and we are unsure as to what else 6.1.3 will fix and when it will be released. If you are anxious to check it out and possibly lose your jailbreak, head over to the iOS Dev Portal and grab it.